Odors of two Valerian species (Valeriana carnosa Sm. and Valeriana clarionifolia Phil. ), grown in the Nordwest zone of Chubut Province (Argentina) were distinguished with an electronic nose (EN) MOSES II (Modular Sensor System) and both valerian varieties were chemically analyzed with TLC (Thin Layer Chromatography). The two valerian species were gathered between March 2000 and November 2001. Specimen of Valeriana clarionifolia Phil. were gathered from two different regions of the same Chubut zone: wood-steppe and steppe. EN and TLC data were compared with those of Valeriana officinalis coming from India. The odors of valerian species were clearly discriminated with the EN enabling to separate not only the different varieties but also the regions from where they were cropped. The statistical Principal Component Analysis (PCA) method was used to evaluate the EN data. TLC analysis was performed to identify the active compounds of valerians. In a previous work  the authors determined that different species were separated because they exhibited a different concentration of active compounds (like the valerenic acid and valepotriates)whose concentration is closely related to sedative properties of valerians. Los olores de dos especies de valerianas (Valeriana carnosa Sm. and Valeriana clarionifolia Phil.) que crecen en la zona noroeste de la provincia de Chubut (Argentina) fueron discriminados con una nariz electrónica (NE) MOSES II (Modular Sensor System) y ambas especies fueron analizadas químicamente con TLC (Thin Layer Chromatography) para identificar sus componentes activos. Las dos variedades fueron recogidas entre marzo de 2000 y noviembre de 2001. Las muestras de Valeriana clarionifolia Phil. fueron recogidas, a su vez, en dos regiones diferentes de la misma zona de Chubut: bosque-estepa ecotono y estepa. Los resultados hallados fueron comparados con los obtenidos con muestras de Valeriana officinalis proveniente de la India. Los olores de los diferentes tipos de valerianas fueron claramente discriminados por la NE permitiendo no sólo separar las diferentes variedades sino también los diferentes orígenes de los cuales provenían. El método estadístico de Análisis de Componentes Principales (ACP) fue utilizado para evaluar los datos de la NE. El análisis con TLC fue realizado para identificar los componentes activos de las valerianas. En un trabajo previo  los autores determinaron que la separación de las diferentes especies se producía porque éstas presentaban una concentración distinta de los componentes activos (entre ellos: ácido valerénico y valepotriatos) la cual está estrechamente relacionada con la capacidad sedativa de las valerianas. In the last decades, a renewed interest on the active components of phitodrugs has arisen generating the necessity of a major control of vegetal raw materials to assure a constant and high quality of final product. Valerians are among plants exhibiting numerous traditional uses in medicine. In Argentine Patagonia grow nineteen native species, mainly in the Andean region though several varieties grow even on the steppe zone. Valerians L.  exhibits several species which are well known by their medicinal value, the Valeriana officinalis L. among them. Active components of valerians include valepotriates (valtrate, isovaltrate, dihydrovaltrate and acevaltrate) and volatile oils of monotherpenes and sesquitherpenes (elemol, bornyl acetate, bornyl-isovalerenate, isovalerate, valerenal, valerenona) and valerenic, hydrovalerenic and acetoxivalerenic acids [1, 3]. The Valeriana carnosa Sm., Valeriana clarionifolia Phil. and the Valeriana Laphatifolia Vahl. are considered among the natives species of Patagonia, which were already used by mapuches communities in the last three centuries . With regards to valerians applications: they are widely used at the present in phitotherapy, in allopathic and homeopathic medicine as sedative infusions and as restaurative of nervous system sicknesses. It was demostrated an anxiolytic effect in human experiments. It differs from barbiturics because it neither interacts with alcohol nor produces hang-over when waking up in the morning. It is also a weakly hypotensor and antispasmodic (intestinal cramps, digestive troubles, muscles cramps related to stresses, etc.) and exhibits diuretic properties [5-8]. In a previous work  performed with the MOSES II electronic nose (EN) was demonstrated that it constitutes a valuable tool to separate different species of medicinal plants through odors discrimination (valerians among them). In the last twenty years, electronic noses appeared enabling to discriminate odors of gas, solid or liquid specimen, performing a fast, continuous and non destructive analysis. long duration measurements are easier to be performed, detection of toxic gases which are odorless for the human nose (i.e, CO). Specimens are placed in hermetically closed vials and a sampler (similar to those of gas chromatographers) takes them from the headspacer to the sensors camera. There are considerable differences among the informations given by the EN or by the gas chromatography or mass spectrometry since, the EN does not separate the specimen components but it discriminates and provides the image of the specimen odors. Specimen preparation: EN specimen of valerians from Patagonia were taken from pieces of rhizomes or roots of valerians by milling them in a commercial coffee grinder. After homogeinization, six samples of 1g were weighed and placed in 10 ml vials which were hermetically closed with Teflon septa and Aluminium strap. Samples were incubated at 70°C for 60 min with an interval of 30 min between samples. The flow of the carrier gas transporting the specimen from the headspace to the sensors camera was 20ml.min-1. 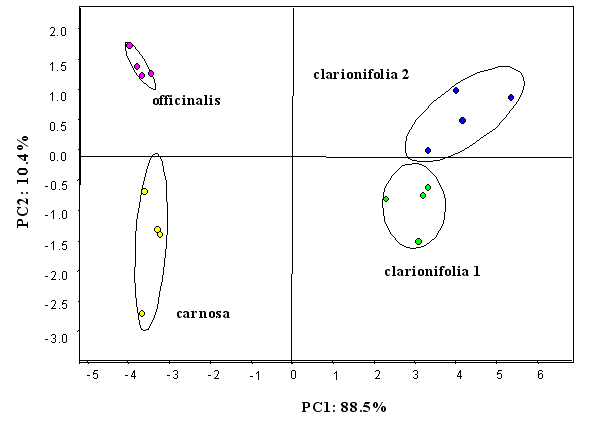 In another experiment, four samples like the above described were evaluated together with other four Valeriana officinalis sample. EN data were analyzed with the PCA method. In order to obtain the chromatographic profiles, each extract was prepared as follows: 0.5g of grinded material was extracted with 5 ml of CH2Cl2 at 40°C for 5 min, filtered and the material remaining in filter was rinsed with 2 ml of CH2Cl2. Both extracts were evaporated to dryness under N2 flow. The residue was redissolved in CH3COOC2H5 to be used for the chromatographic analysis. Samples were seeded on Merck-G 60 F254 Silicagel layer. A mixture of (3:1) toluene:ethylacetate was used as a mobile phase and the development was performed with a mixture of (2:8) Hydrochloric acid:Acetic acid enabling to identify: valtrate, acevaltrate e isovaleroxi-hydroxi-dihydrovaltrate (IVHD), all them in blue color while the other identified compound: dihydrovaltrate turned to brown color. 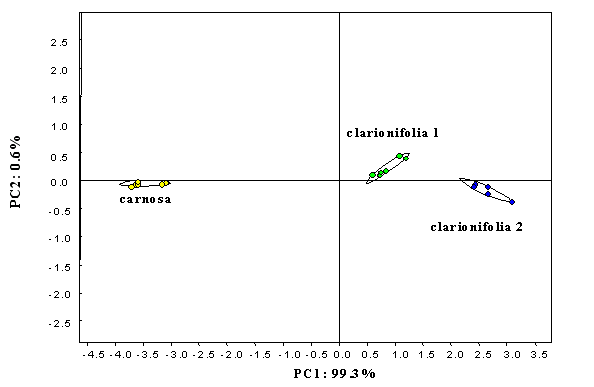 Figure 1 shows the PCA plot, as obtained with the MOSES II EN, of the two Argentine valerian species (Patagonia): V. carnosa y V. clarionifolia. The last specie presents two forms arisen from two different zones: wood-steppe isotonus (clarionifolia 1) and steppe (clorionifolia 2), respectively. EN measurements were taken with both types of sensors sets. A clear discrimination of the three types of samples was obtained, the major part of information being concentrated on the Principal Component 1 (PC1: 98%). 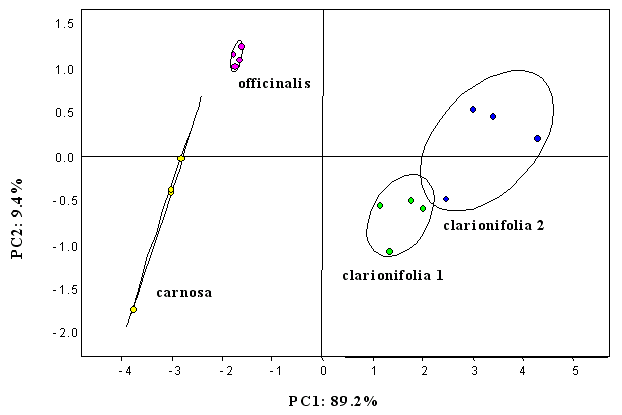 Odor of V. carnosa is different from odors of V. clarionifolia, the odors of both types of this specie are similar as they grow close to each other. Figures 2 and 3 are the PCA plots corresponding to the same specimen of Figure 1, measurements taken with the QMB sensors set (Figure 2) and with the SnO2 sensors (Figure 3), respectively. The two sets give similar informations, the QMB sensors giving the best discrimination. EN measurements with the three above considered specimens and the V. officinalis (from India) are shown in Figure 4 (with both sensors sets), Figure 5 (with QMB sensors) and Figure 6 (with SnO2 sensors). 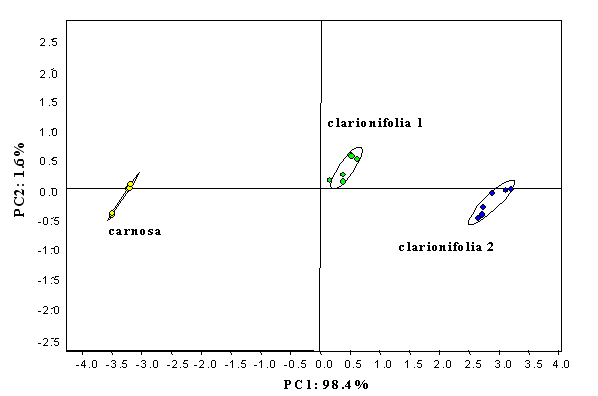 The use of both sensor sets enables to discriminate the four types of specimen but, the data of the two types of V.clarionifolia (coming from diferent regions of the same zone) appeared nearer than before (Figure 1). 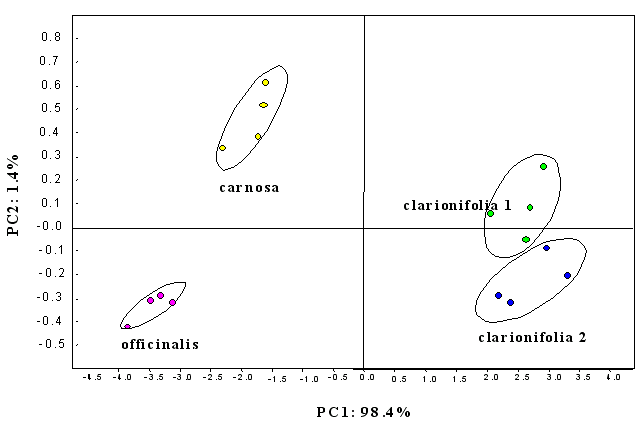 Odors of V. carnosa and V. officinalis seem to be similar in plot of Figure 4 (major information on PC1: 84.5%). If only QMB sensors set is used for EN measurements (Figure 5) it appears more or less the same configuration than in Figure 4 but, odors of V. carnosa and V. officinalis seem better discriminated (PC1: 88.2%). 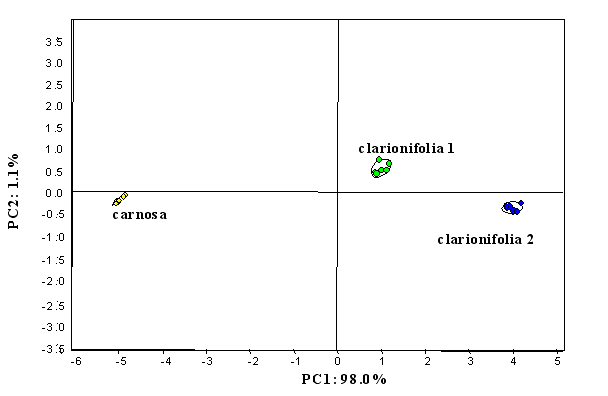 Figure 6 (EN measurments with SnO2 sensors) gives once again the optimal discrimination since odors of V. carnosa and V. officinales are well separated between them and with regards to V. clarionifolia. Odors of both types of V. clarionifolia, are also discriminated but they smell similar. Besides the best discimination is given by QMB sensors. Figure 1: PCA plot of Patagonic valerian species. MOSES II EN measurements with both sensors (QMB + SnO2) sets. Figure 2: PCA plot of Patagonic valerian species. MOSES II EN measurements with only one sensors (QMB) set. The TLC analysis is shown in Figure 7, appearing from left to right the following information: V. officinalis L.(1), V. clarionifolia Phil. (2) and V. carnosa (3) together with dihydrovaltrate (4), iso-valeroxi-hydrovaltrate (5), valtrate (6) and iso-valtrate (7), the four last data corresponding to the pure active compounds of Valerians taken as references. The analysis of data shows that the V. officinalis (from India) contains the 4, 5, 6 and 7 compounds; the V. clarionifolia contains 5, 6 and 7 compounds in minor concentration while the compound 4 is absent. Similar data were found for the V. carnosa. In a previous work  the authors found that the valepotriates concentration in different origen V. officinalis was always ~1.2%. This concentration assures good therapeutic properties. Higher valepotriates concentration (>2.8%) were found in the V. walichii specie. It is known that higher concentrations of valepotriates (>3%) are able to produce cytotoxic and mutagenic effects . Figure 3: PCA plot of Patagonic valerian species. MOSES II EN measurements with only one sensors (SnO2) set. Figure 4: PCA plot of all the analyzed valerian species. MOSES II EN measurements with both sensors (QMB + SnO2) sets. Figure 5:PCA plot of all the analyzed valerian species. MOSES II EN measurements with only one sensors (QMB) set. Figure 6: PCA plot of all the analyzed valerian species. MOSES II EN measurements with only one sensors (SnO2) set. 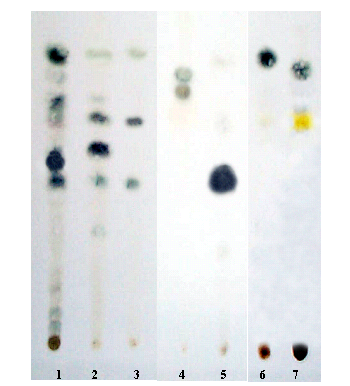 Figure 7: Chromatographic (TLC) profiles corresponding to: 1. V. officinalis L., 2. V. clarionifolia Phil., 3. V. carnosa Sm., 4. Dihydrovaltrate, 5. Iso-valeroxi-hydroxi-dihydrovaltrate, 6. Valtrate and 7. Iso-valtrate. The authors are indebted to the ANPCyT by Grant (PICT 8688) given to N.E.W.R, which enabled this work to be accomplished.